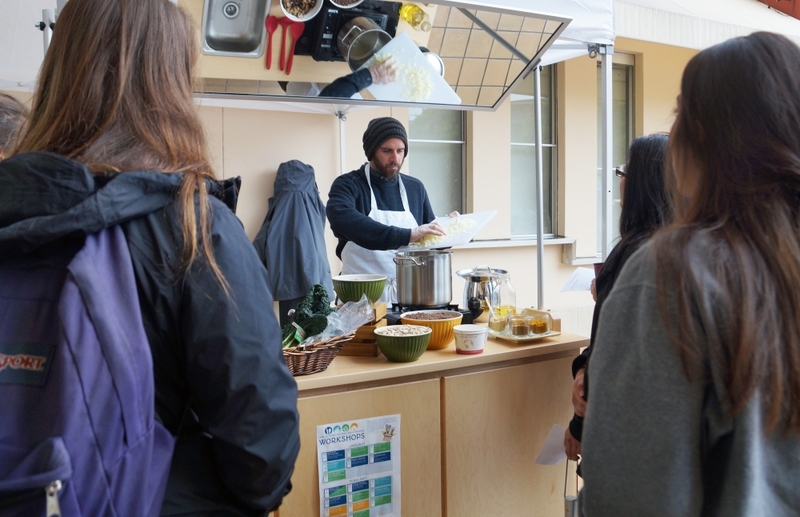 UCSB Soup Guy Mickael Blancho instructs students in the art of simple soup in the inaugural workshop for the campus's new Food, Nutrition and Basic Skills Program. 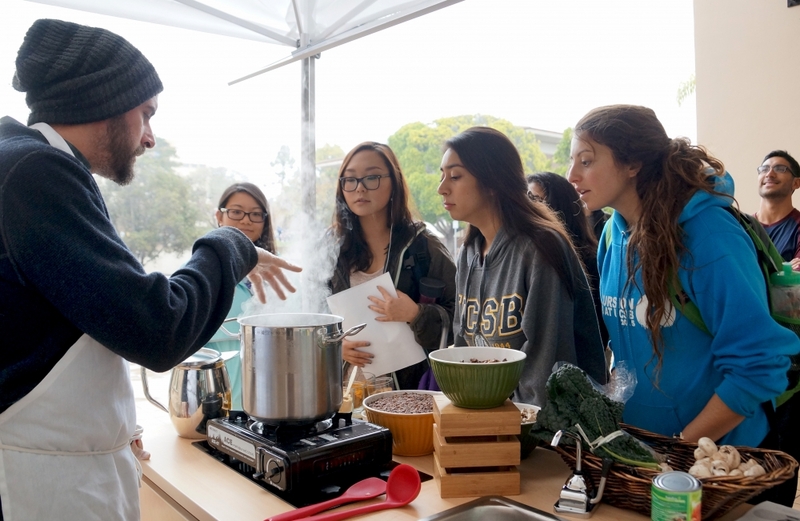 The new Food, Nutrition and Basic Skills Program for UCSB students aims to improve food security with instruction in cooking, shopping, meal planning, budgeting and more. It’s an age-old story: The cash-broke college student surviving on cheap instant noodles and fueling late-night study sessions with only soda — the notion of three square meals a day pure fantasy, thanks to both time and financial constraints. The story needs to be rewritten, says a growing chorus of voices advocating for more food awareness, and improved food security among the student population. A new pilot initiative at UC Santa Barbara is aimed at providing exactly that. 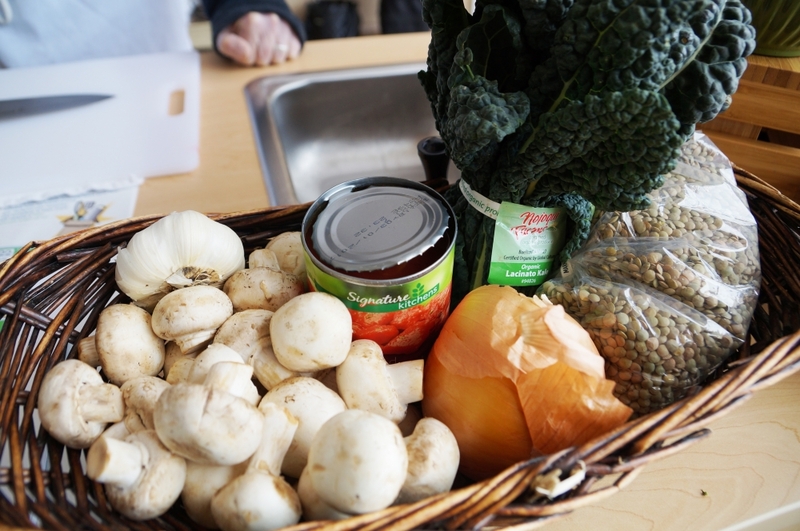 The just-launched Food, Nutrition and Basic Skills Program offers students comprehensive instruction in budgeting and meal planning, basic kitchen skills, cooking and nutrition, as well as insight into food as a crucial piece of the sustainability puzzle. Created by the UCSB Food Security Working Group — a campus-based, collaborative offshoot of the systemwide UC Global Food Initiative (UCGFI) to ensure adequate nutrition for all — the program’s overall goal is to provide students with foundational skills that will better equip them to live on their own. UCGFI in 2015 granted each campus $75,000 to address food security and create food security plans. “This is such an important program and I hope we can help shift campus culture,” said Mike Miller, leader of the working group and director of UCSB’s Office of Financial Aid and Scholarship. “UCSB is an amazing place and our students get a world-class education, but what good is any of that if we are not a healthy campus? Running through February, the fledgling effort offers multiple workshops each week on subjects such as navigating and maximizing the dining commons, cooking with five ingredients or less, shopping on a budget, managing debt and staying healthy in times of stress. Additional classes cover everything from recipe planning and tenants’ rights to seasonal cooking and cutting food costs through bulk purchases. “When you look at making people less food insecure, it’s important to not just help them with how to prepare food,” said John Lazarus, the assistant director of UCSB’s University Center (UCen) Dining, a partner in the new program. “It’s just as important to assist them in making informed choices about how they pay for things (including student loans and working while in school), how they spend their money, what they buy and where they shop, and being mindful of how complex our food system is. From balancing whether to buy organic or not (acknowledging that there are often differences in price), to having people think about how workers are treated at a place that sells a hamburger for a dollar, the Food, Nutrition and Basic Skills Program strives to teach people about their place in our community. An impressive cross-section of the campus community is already involved in the new endeavor. The program curriculum was conceived and designed collaboratively by representatives of, among others, the UC Global Food Initiative, UCSB Sustainability, Financial Aid & Scholarships, the Associated Students Food Bank, Student Health, Environmental Affairs Board, UCen Dining, UCSB Health & Wellness, Housing & Residential Dining Services and the Isla Vista Food Co-op. “We are excited and grateful for the many partners who have spent time working on this calendar to begin to learn what is needed and works for students,” said Tuyen Nguyen, AS Food Bank coordinator and a key member both of UCSB’s Food Security Working Group and broader UCGFI taskforce. “The majority of our food bank clients are between the ages of 18 and 22, living on their own and managing their own budgets for the first time. This program will help them gain skills to maximize the resources around them, such as fresh produce or other items in our pantry that are unfamiliar to them. “In the future, we hope to provide more culturally relevant education and workshops that are tailored to specific community needs,” she added. Also on the horizon for UCSB’s food security efforts: A bigger push to enroll eligible students in CalFresh, a state-run program that gives monthly food benefits to low-income households. According to Miller, the financial aid director, as many as 10,000 UCSB students could qualify for CalFresh and the $180 per month it provides for food purchases. His office recently hired two students to help other Gauchos navigate the application process. “I really saw this as a great place to start because it was low-hanging fruit, if you will,” Miller said. “I’d love to see us enroll more students in the CalFresh program, but it is just the tip of the iceberg. Knowing how to shop, budget and cook are equally as important, which is why what we are going as a campus with the Food, Nutrition and Basic Skills Program is so amazing. More information about the program, including a complete workshop schedule, can be found via the A.S. Food Bank.